One of Early Access's actual success stories is finally making the plunge to retail. "Early Access" is a concept that has divided the gaming community like no other issue, with some clamoring in support of being able to "buy-in" to a game at the development level, and others taking disdain in the fact that developers are expecting us to pay to beta test their games for them. While there have been countless cautionary tales, the one thing we can all agree on is that Kerbal Space Program has been a massive success, and the poster child for a successful Early Access game. And now, the team is finally ready to blast off from Early Access, and go full-retail. "As development in Beta has progressed, one thing has become very apparent," writes SQUAD's Felipe "HarvesteR" Falanghe, "Kerbal Space Program is about to reach a state in which every single one of the original goals for the game has been reached, and we can say that our original design document has been fulfilled." He says that the team is currently prepping the game's 1.0 patch, which will officially bring it out of early access, and into the sphere of full retail releases. But, for those of you worried that progress on the title will stop, fret not! 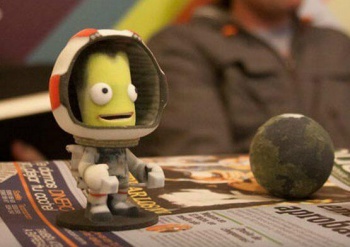 "We see no better way to follow up on reaching our initial goals than to continue development on Kerbal Space Program, beyond Beta, past our original plans," said Falanghe. The 1.0 update will also include new, more realistic modelling of drag and lift, an 'Engineer's Report' warning of crucial design flaws, a game over state, and female Kerbals. You can check out a full change-log here. While there's currently no solid release date for the update, we can probably expect it to launch in the coming weeks.